Mobile Kitchen for Catering and Special Events! 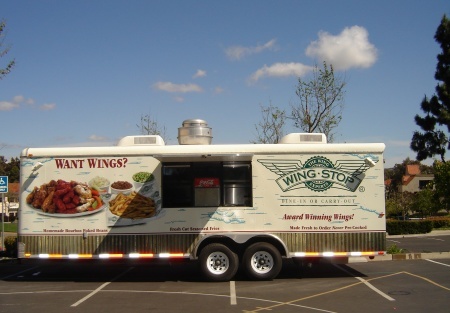 Custom mobile kitchen to take your awesome food on the road! We�ve all said it a million times, Once they�ve tasted the food; we get them as a customer for life! Special events, street fairs, County fairs, catering events ... extend your reach beyond the four walls of your restaurant. Built in 2005, this is an 8� x 24� self contained mobile kitchen. Utilities, refrigeration, ventilation, heating and AC, waste water, grease trap and more � a rolling restaurant inspected and approved for use by the Health Department; permitted through 8/2007. Our contractor built this our specs and to California Health Department standards; all new NSF approved equipment and maintains a consistent �A� rating from the Heath Department with over 15 inspections over the last year. Custom graphics to be removed prior to delivery. Coordination for the installation of your own graphics can be done outside the scope of this transaction. Franchise rights not available for transfer or sale by owner.This is a Stone Path Brokerage Services, Inc. DBA Selling Restaurants San Diego listing.